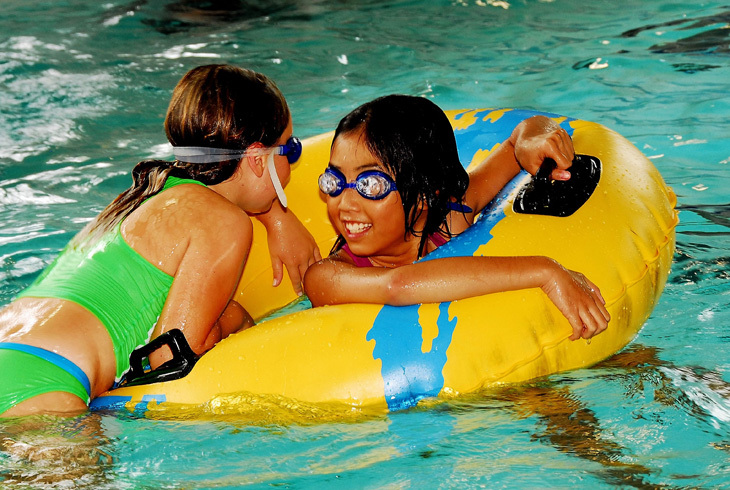 Unlimited admission to aquatic drop-in activities is included with the purchase of a General Pass. Daily rates are also available. All of the following aquatic programs are offered -- most daily -- at the district's six year-round pools, and at two additional sites during the summer. Unlimited admission to these activities is included in the purchase of a General Pass. Daily drop-in rates are also available. Unstructured swim for guests of all ages. An adult or guardian must accompany any child under 43 inches from the chin down and under the age of 7. Children under 18 must be accompanied in the water by a parent. An adult must be within arm’s reach of all non-swimmers. An open session, like open swim, for anyone over the age of 55 to enjoy lap swim or recreational exercise. Designed for those 18 years and older who can swim lengths of the pool on a non-stop basis. Participants are required to follow the designated circle swim pattern. Generally fewer than 6 lanes available. Designed for anyone who can swim lengths of the pool on a nonstop basis. Must be able to understand and follow the principles of lap circle swim etiquette. Available May-September, weather permitting, the district's only splash pad is designed for children of all ages. A toddler bay includes several low-spraying features. For older children, the site includes dumping buckets and sprays that can be aimed at each other. The Aqua Challenge measures nearly 40 feet long, 6 feet wide and more than 7 feet high at its apex. It can support kids of all sizes, supporting up to 400 pounds. The “challenge” is staying on the device, which requires some concentration … or a plunge into the water below. The shallow end of the pool is for width water walking only at this time. A section in the middle of the pool will be reserved for width lap swimming. Unlimited admission to the activities below is included with the purchase of a Deluxe Pass. Daily drop-in rates are also available. Click here for a complete schedule of Aquatics group fitness classes. Join the fun and get energized with this non-impact deep water exercise. Experience fast-paced and challenging moves that will build your water endurance and pump your cardiovascular system. Special equipment can be used to increase resistance, strength and overall conditioning. Floatation belts are provided. Come enjoy this low-impact fitness class. You will experience lively music and a social atmosphere as challenging exercises improve your strength, flexibility and balance. This is a low to moderate intensity aquarobics class.